Miriam Schroeder MD - Office Location - Miriam Schroeder, M.D. Dr. Schroeder's office is located at 3115 South Grand Blvd, Suite 400. The office building has a secured entry system. Upon your arrival, you will note the directory just outside of the main entrance. At the top of the directory you will find directions for using the phone entry system. Read the instructions about the phone system, then locate our code on the directory below. Use the phone system to call us and we will "buzz" you in. The office is on the fourth floor. The building has an elevator and is handicap accessible. Metered Parking is available on the streets surrounding the building. 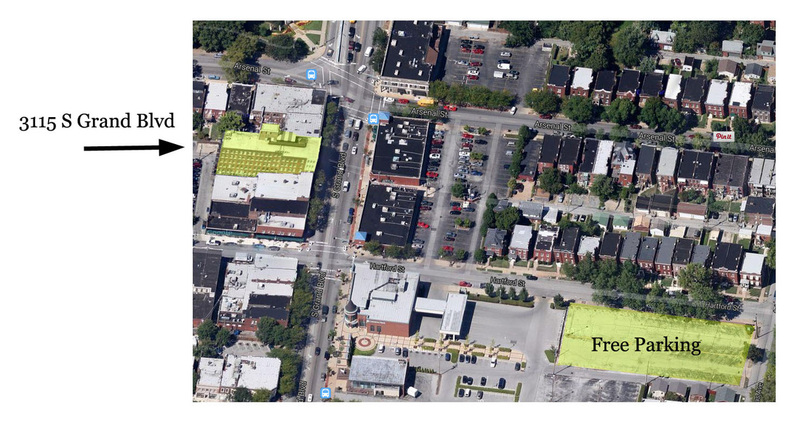 Additionally, a free parking lot for patrons of South Grand businesses is located approximately 1/2 block away, behind Commerce Bank and just off of Hartford Street (see image at right). There is always ample space available in the Hartford lot.